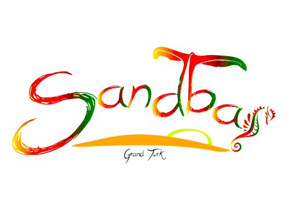 I don't need a shell held to my ear, the Majestic Sandbar peacefully drew me near. A never ending horizon from its deck the sun peeped. 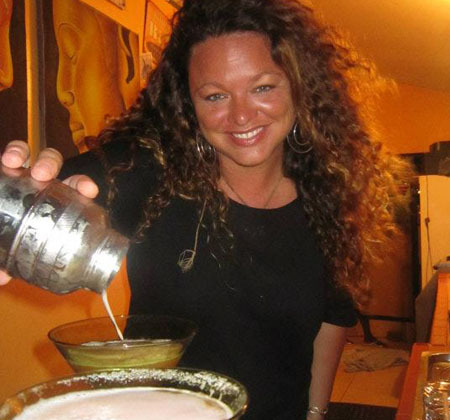 Beautiful people and personalities; all loving, some quite unique. The smell of cracked conch filled the air and grew the crowd. 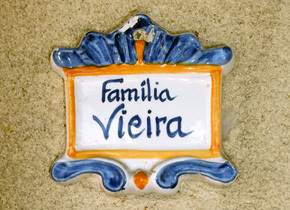 One big happy family, warm as the Vieira ladies' smile. 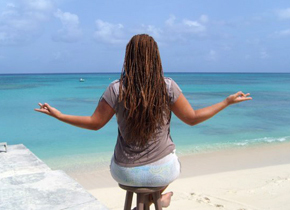 The rolling waves were meditating with a refreshing ocean mist. My feet upon the sand as the warm waves kissed. My innocence restored, soul and earth entertwined. I believe God stood with me restoring peace to my mind. 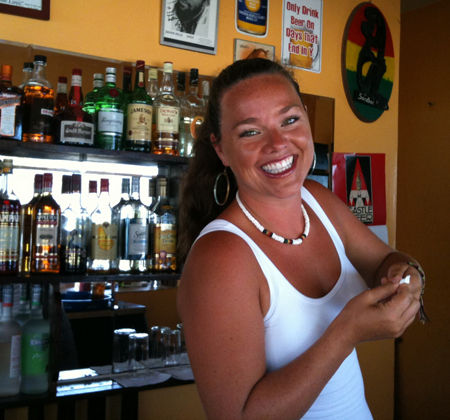 ~Lucius M. Johnson, Sr.
Tonya & Katya are waiting to serve you from a great selection of beer, wine, mixed drinks, and island favorites. 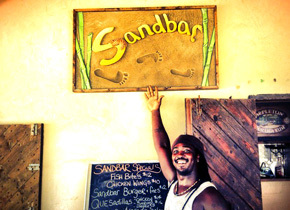 Sandbar's menu includes a wonderful selection of local fish, conch, lobster, Sandbar burgers, salads, quesadillas, delicious desserts, and more. See you soon! Don't miss out on our signature drink. It's an island classic! 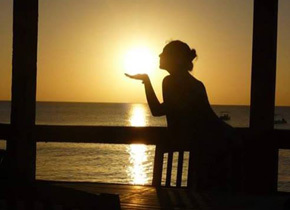 Enjoy the spectacular view of the setting sun at this most picturesque location. 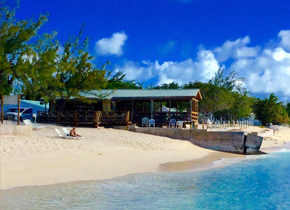 Manta House and Sandbar are both proudly family operated by the Vieira sisters since 2000. 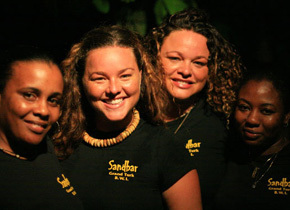 Tonya, Katya, and the rest of Sandbar staff are ready to take your order! 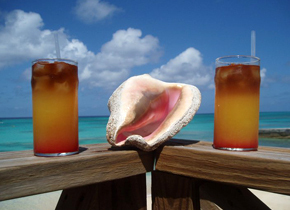 Relax on our deck while sipping an ice cold beer or our signature Rum Punch. 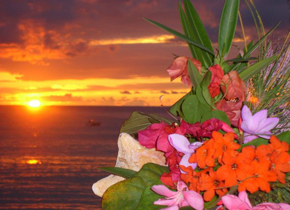 Dive into our home cooked specials featuring juicy burgers, tasty wraps, and island conch. Join us every third Tuesday at 7pm for a chance to win a free food tab from our delicious kitchen! 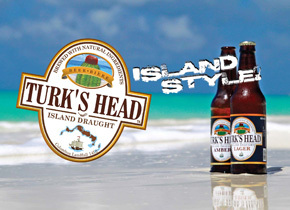 Drink in true island style with a Turk's Head Lager or Turk's Head Amber. 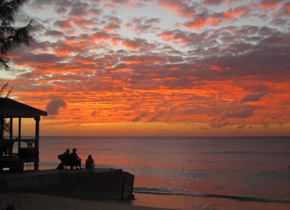 Come to Sandbar for the spectacular Grand Turk sunsets that set the sky on fire. Take a break from the sun on our roomy deck or at a comfy bar stool. 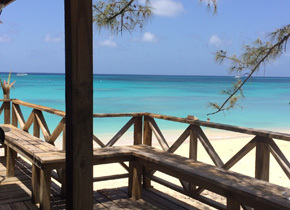 There's no view quite like the one you'll find on the deck at Sandbar. 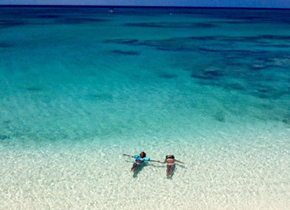 Take a refreshing dip in the gentle ocean waves right beside Sandbar. 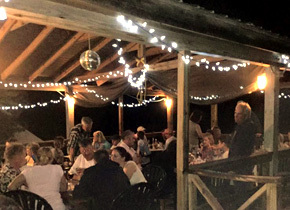 Watch the day give way to night on the picturesque deck of Sandbar. 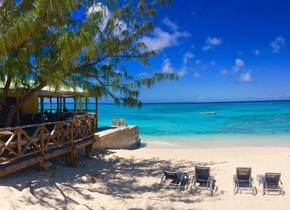 The natural landscape around Sandbar is enough to take your breath away.